Every now and then, someone will ask, "You want fish?" It's usually my dad, my brother Warren or my cousin Brian. They're the fishermen in the family. Today it was my mom asking. A friend of theirs has a son that went fishing on a long-range, deep sea fishing excursion. 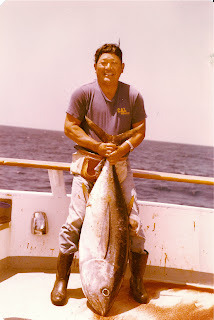 He caught tuna, and his parents gave several vacuum-packed pieces to my parents, and now I'm getting one! I remember my dad going fishing and bringing back a bunch of albacore and making a big platter of sashimi--probably quadruple this amount. My kids were in elementary school and their friend Bobby was over. I let them eat as much as they wanted. They ate and ate and ate--until my mother-in-law took it away from them and said (in Japanese), "It's wasteful for you to eat so much!" The kids always knew what was good. 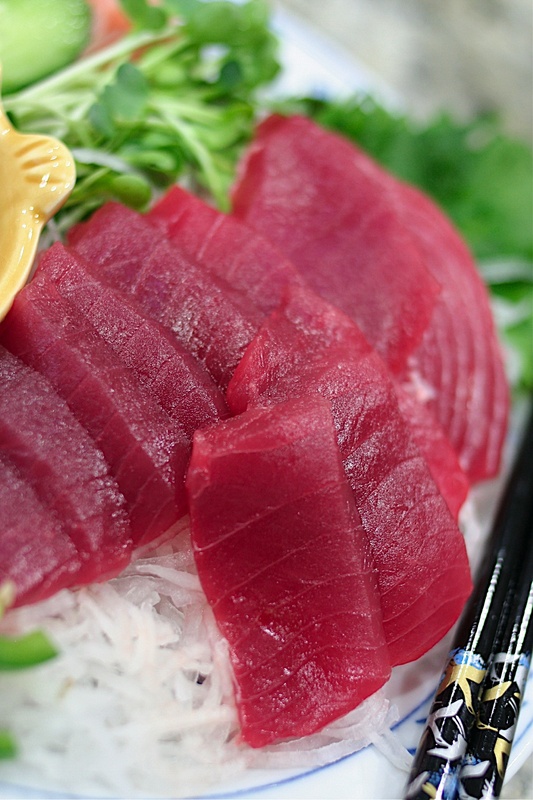 What's on the menu for today is home-style sashimi. 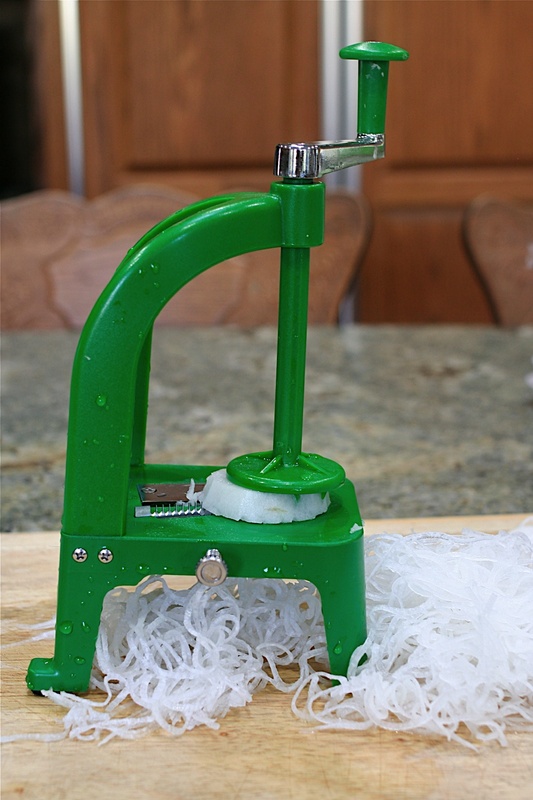 This is a spiral vegetable cutter. Peel & cut the daikon into about 4 inch pieces. 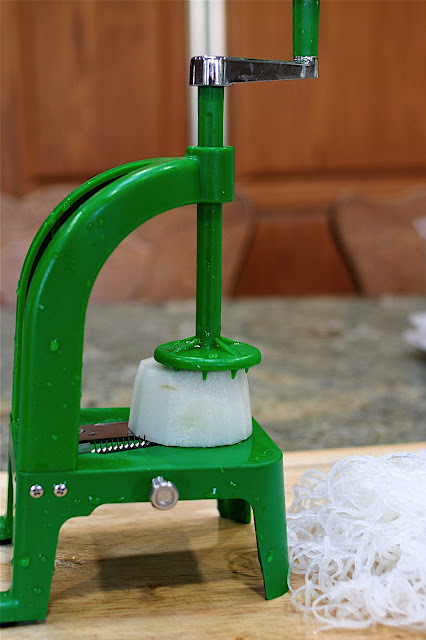 When you turn the handle, it turns the daikon into long threads. Gently squeeze out the daikon threads and place them at the bottom of your platter. You can thinly slice some lettuce if you don't have a spiral cutter. This is shiso. I love shiso. You can get them at Marukai or Nijiya. They're labeled Oba. It's also called Beefsteak or Perilla. We call it shiso. Cut the stems off the shiso and wash the leaves. 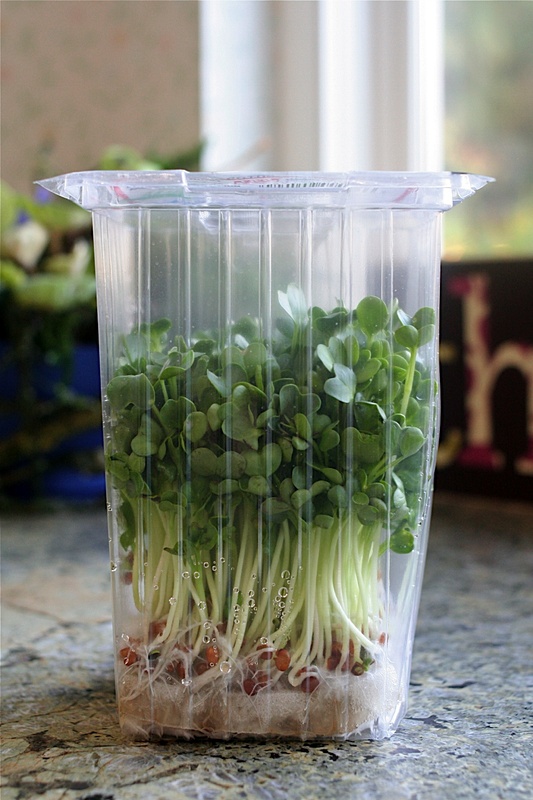 Daikon sprouts. They'll add a fresh little bite of spiciness to the sashimi. When you buy it, you want to get the one that's not real tall. Wash them and pull off a little section at a time. Cut off the roots and seeds. What you don't use for this meal you can put into sandwiches. This is how I got the fish. Vacuum packed. You can get sashimi-grade fish at Marukai in West Covina or Nijiya Market. It's already cut in a nice, tidy block, easy to slice. It's not like getting fish when someone shares it with you, but it's a lot less expensive than going to a sushi bar or restaurant. First, you want to be sure your knife is sharp. 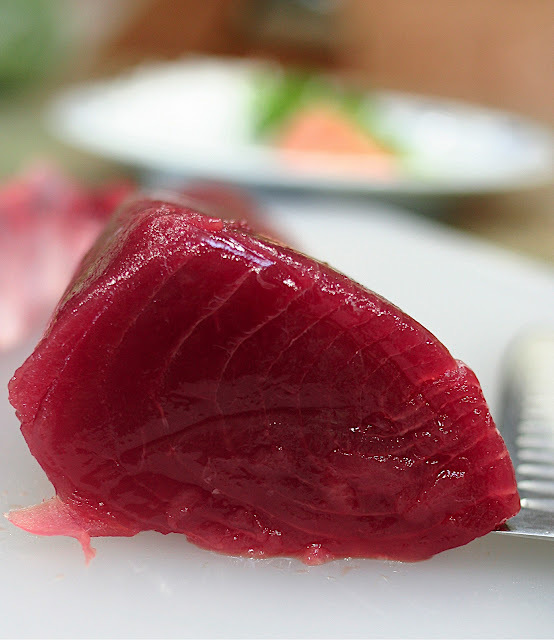 My mother always used a really long, thin knife to cut sashimi. I don't have one of those, so I'm using my sharpest knife. This is the fish out of the bag. First, cut off the side piece. There's a tendon running there, and you don't want that for sashimi. I started slicing this whole, but it was too big, so I cut it in half horizontally. That made good bite-sized pieces. 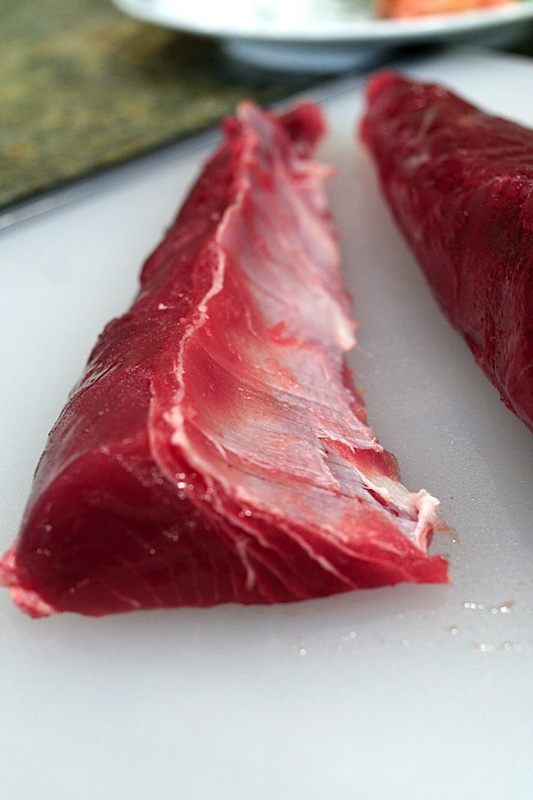 If you have a long knife, you can slice the fish in one continuous motion. That's proper. But my knife is shorter, so I slice through the fish with a down-and-away-from-you motion first, then a pulling-the-knife-back-to-you motion. You're not supposed to saw at the fish. After each slice, you place all the slices in a row, leaving a nice reveal of the previous slice. Then, picking them all up by sliding your knife under the slices, arrange them on the daikon or lettuce. Then, arrange the condiments around the fish. 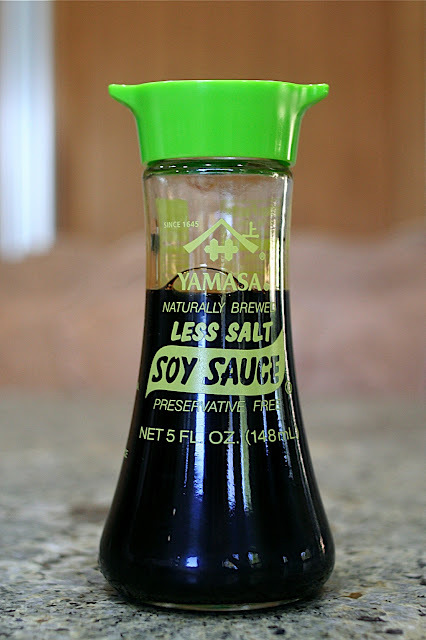 The green top shoyu is the 'less salt' variety. 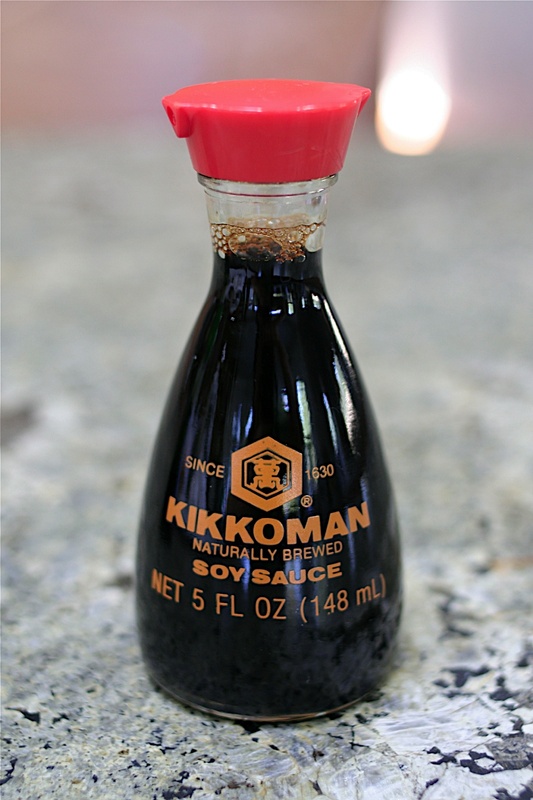 The red top is regular shoyu. Always serve some kind of shoyu with sashimi. Have some individual plates so each person can take a little. Mix some wasabi with shoyu. The wasabi you mix yourself from the powdered form is better than the one already prepared in the tube (which is all I had). Have some shoga--pickled ginger--on the side. It's good with a small slice of jalapeno. Makes me think of my son & all his friends going to Benihana for sushi when they were in high school and their early college days. That Benihana era was great, wasn't it. I LOVED the stories those boys would tell about eating sushi! You can arrange it any way you like! Or simply eat it plain. It makes for a delicious meal! Oh, one of my favorite ways to eat fresh fish. Heaven! Looks even better in the photos, wish I had some now. Oh my, this looks soooooo good!! I never thought about eating sashimi with jalapeno, etc... but now I HAVE to try it! Gorgeous photography once again.